Thanksgiving is a wonderful time of year for bringing together friends and families to enjoy laughter, delicious food and of course, give thanks. However, it can also bring some potential hazards for your pets. Before you defrost your turkey and set your table, here are some important tips to help keep your pup safe and happy during the holiday. Your Thanksgiving meal may be delicious, but it can also be harmful for your four-legged family member. 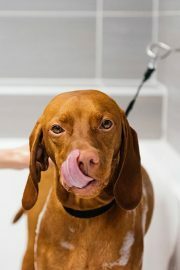 The mouth-watering smells that fill up the room can have your dog pleading for a taste, but ingesting rich meats, certain vegetables, and desserts can make your pup sick or cause some serious health problems. Sodium-heavy food like turkey skin and gravy can cause severe stomach issues, constipation, diarrhea or vomiting, and can also put your dog at risk for pancreatitis. 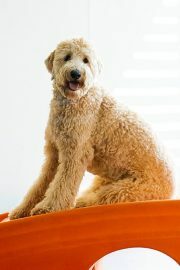 Plus, the fat content of Thanksgiving meals can be difficult for your dog to digest. As tempting as it is to slip your pup a bite, we urge you to keep the feast on the table. Just because your dog can’t eat what you eat doesn’t mean you have to exclude them from the festivities. 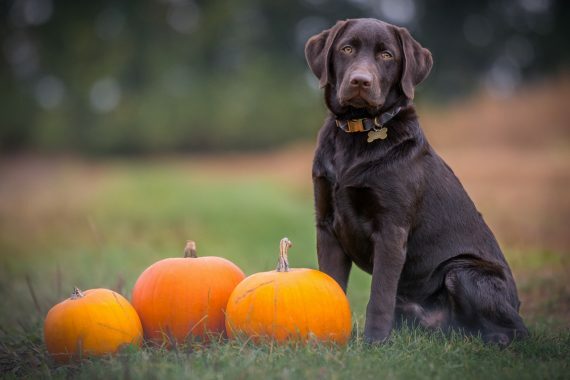 Making a special meal or treat for your pup is a great way to let them take part in the Thanksgiving celebrations. Sweet potatoes (without butter) are packed with vitamins, potassium, and fiber and are a great add-on to your dog’s regular food. 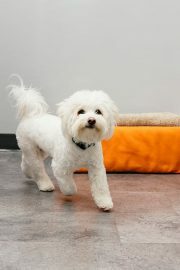 A small amount of cooked turkey, unseasoned and without skin or bones, can also be a fun treat for your pup. Thanksgiving can mean hosting a lot of guests in your home, and sometimes these visitors can cause your pet emotional stress. Lots of new people and higher noise levels may make your pup nervous. 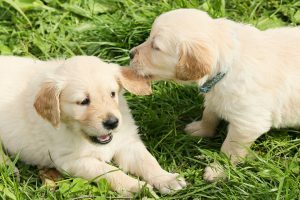 Depending on your dog’s temperament, you may want to keep them in a quiet place away from the action. When your dog becomes more comfortable around the extra noises and guests, reward them with treats for their calm behavior. 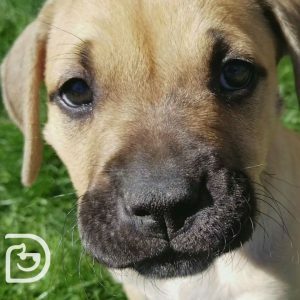 Educate your visitors on how to act with your pup and remind them not to feed them any table scraps, no matter how cute they may look when begging. 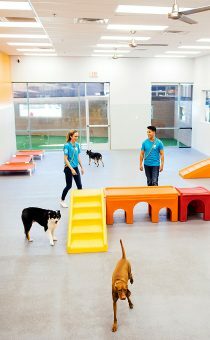 As guests come and go, there could be opportunities for your pup to escape amid the chaos. Before your visitors arrive, make sure your dog’s collar is on securely and fastened properly. Check that their identification tags are attached and include your current contact information. If your pet doesn’t already have one, a microchip is a good idea. This allows your pup to easily be identified if you get separated, even without a collar. 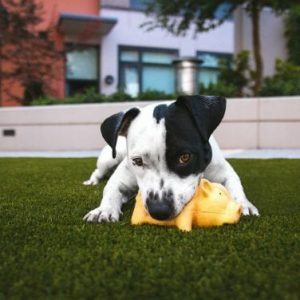 The holidays are filled with fun, friends, and family, but also loud parties and busy schedules, which make it easy to forget that your furry friend may be just as stressed as you are. To reduce the anxiety your pup may be experiencing during this busy time, keep up with your dog’s regular routine. Try to stick to their normal walking, eating and sleeping schedules to provide a sense of normalcy and ease their nerves. Keeping these tips in mind will make Thanksgiving as stress-free as possible for you and your pup. 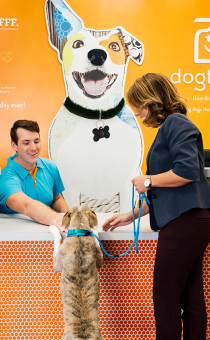 If you need a safe and fun alternative for your pup during the holidays or even while you’re out running errands for the big day, we’re here to help. 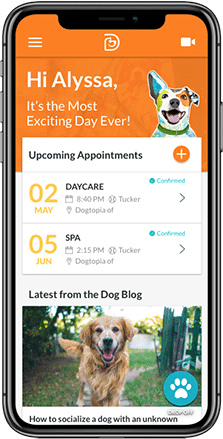 Dogtopia offers reliable dog daycare and overnight boarding services, allowing you to treat your pup to a fun-filled day that will leave them happy and ready for a restful night of sleep in a home-away-from-home. Learn more about our services or contact the location nearest you for more information. 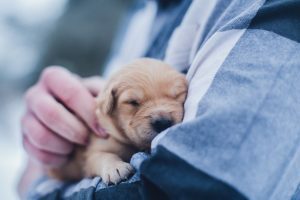 Top 5 Reasons We Love Puppies!